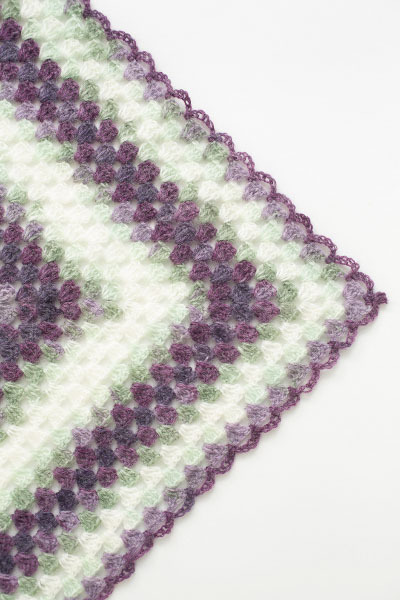 This crochet triangle shawl is an easy project for granny square lovers. A thin yarn in bright colors transforms this pattern into a lightweight shawl that’s perfect for spring or summer. 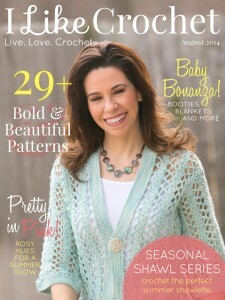 Worked in rows and using simple crochet stitches, this pattern features a scalloped edge for a fun and flirty finish. Use the same stitch pattern with a thicker yarn for a cozy fall or winter shawl. Make an easy crochet triangle shawl for an accessory to add instant glam to any outfit. Choose shimmery yarns to ensure all eyes are on you when you wear this. Use stitch marker to mark center ch-3 sp. Move marker up each row. When using a yarn with long color repeats like Patons Lace, when joining new yarn, start with next color in pattern repeat. Row 1: Ch 4 (counts as dc plus ch-1 sp here and throughout), (3 dc, ch 3, place marker in ch-3 sp, 3 dc, ch 1, dc) in ring. Row 2: Turn, ch 4, (3 dc, ch 1) in next ch-1 sp, (3 dc, ch 3, 3 dc, ch 1) in center ch-3 sp, (3 dc, ch 1) in next ch-1 sp, dc in third ch of turning ch. Row 3: Turn, ch 4, *(3 dc, ch 1) in next ch-1 sp* across to center, (3 dc, ch 3, 3 dc, ch 1) in center ch-3 sp, repeat from * across to end, dc in third ch of turning ch. Rows 4-48: Repeat Row 3 45 times, or until shawl measures approximately 53” (134.5 cm) across long edge. Do not fasten off. Row 1: Ch 1, sc in same st and in next ch-1 sp, *sk 3 dc, sc in ch-1 sp, ch 5. Repeat from * across to marked ch-3 sp, (sc, ch 5, sc) in ch-3 sp, ch 5, repeat from * across to last ch-1 sp, sc in ch-1 sp and in turning ch, fasten off. Optional: Spray block to shape.